← Mini USB Port On Your Cell Phone – Now Useful! ‘Go Green’ has become the mantra for tech companies. Environmentally responsible tech products have caught up all over the world and businesses are looking for various ways to cut their carbon footprint. 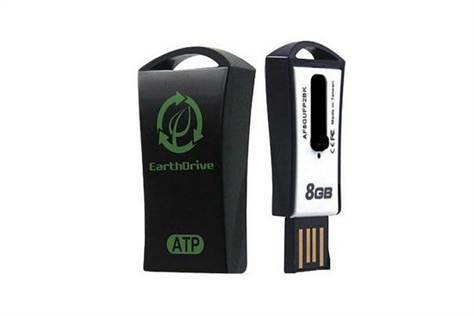 ATP is a cool green company that recognized the growing concern with waste generated by disposed USB drives. They decided to do something about it. ATP is based in Taiwan, founded in 1991, is famous for their DRAM modules and NAND flash storage products. ATP has partnered with American Forests, an international organization that strives to restore forest ecosystems, to come up with an eco-friendly USB drive that is completely bio-degradable. The EarthDrive, a fully bio-degradable USB flash drive, is the result of their efforts. The ATP EarthDrive is made of bio-degradable PLA (PolyLactic Acid, which comes from fermented corn, cornstarch or sugar cane) and therefore does not contribute to waste after disposal. Not only is the EarthDrive bio-degradable, the material is supper durable; it is shock, dust and water proof. The EarthDrive has a retractable connection port to protect the connectors when not in use. The EarthDrive currently has limited availability in the US and is priced around $25, ATP contributes a portion from every sale to American Forests. This entry was posted in Articles, ATP Electronics, Flash Drive, USB Flash Drives and tagged ATP, ATP EarthDrive, bio-degradable USB flash drive, EarthDrive, eco-friendly USB drive, Worlds First Bio-Degradable Flash Drive. Bookmark the permalink.